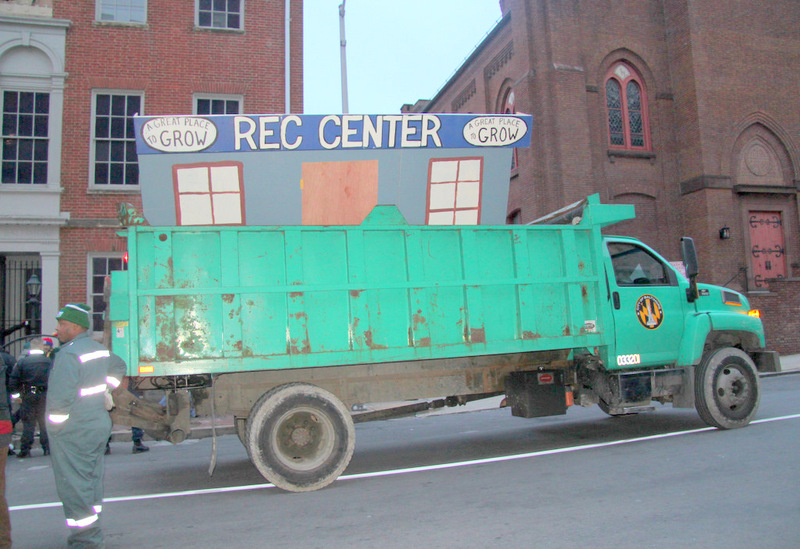 Above: Baltimore City Police load protesters’ large, wheeled “Rec Center” sign onto a city trash truck. 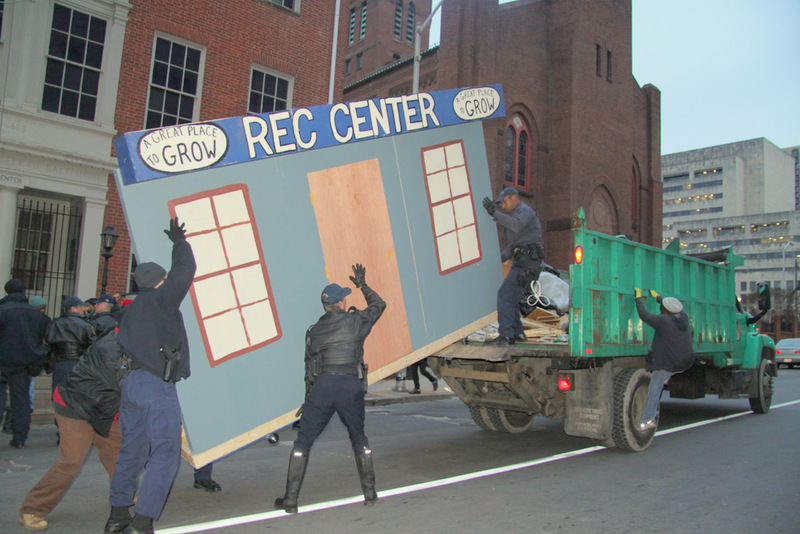 Baltimore City Police today threatened to arrest members of a group protesting the privatization of city recreation centers, and then seized the group’s large, wheeled sign, throwing it into a city truck. The blue-and-red plywood sign said “Rec Center” and “ A Great Place to Grow.” A group of about 25 people advocating more funding for rec centers had been trying to roll the sign along a city sidewalk to a late afternoon “Schools not Jails Recreation Occupation” protest in front of City Hall. Keeping up a brisk pace, the group had been wheeling the rec center sign on the sidewalk along Holliday Street which (aside from police, protesters, media and a homeless person sleeping in a doorway) was deserted. Less than a block from City Hall, Maj. Robert L. Booker Jr. stopped them. He positioned himself in an especially narrow part of the sidewalk, blocking their way. “You’re blocking my way,” said Mike McGuire, who had just moments earlier been using a cordless drill to attach the sign to its rolling base. “I’m not blocking the way, I just want to cross the street,” Booker said, smiling and not making a move to cross. McGuire told him there was a crosswalk at the end of the block but Booker, still smiling, didn’t move. It was pretty clear what was about to happen. Nearly a dozen armed SWAT team police were closing in from the street – the only place McGuire and the protesters could go if they didn’t want to plow into a completely stationary uniformed Baltimore City Police major. The two green city trucks were there, at the ready. 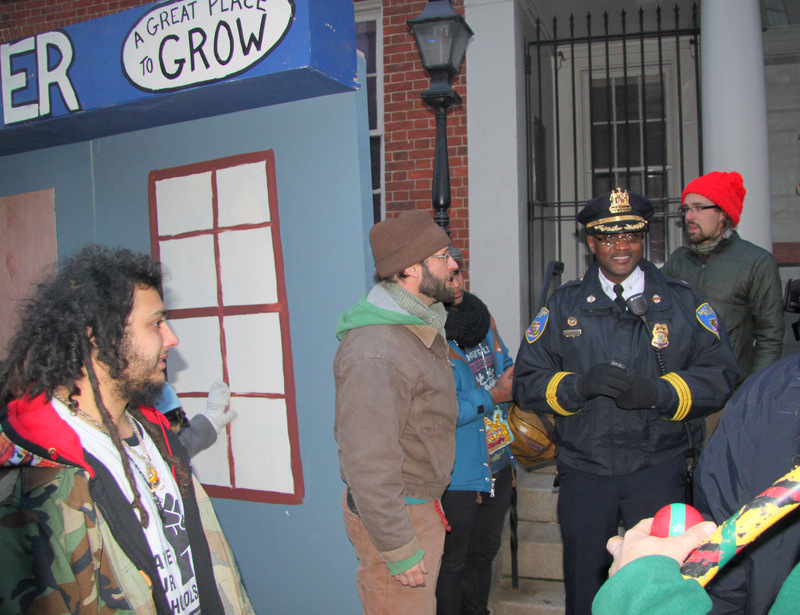 Also present today was city police SWAT team supervisor Maj. Anthony Brown, who presided over a police action Monday in which workers dismantled a small symbolic red school house that the Schools not Jails group and the Algebra Project and Occupy Baltimore members had erected. The city SWAT team had seized the group’s large tent, throwing it in a city truck along with trash. 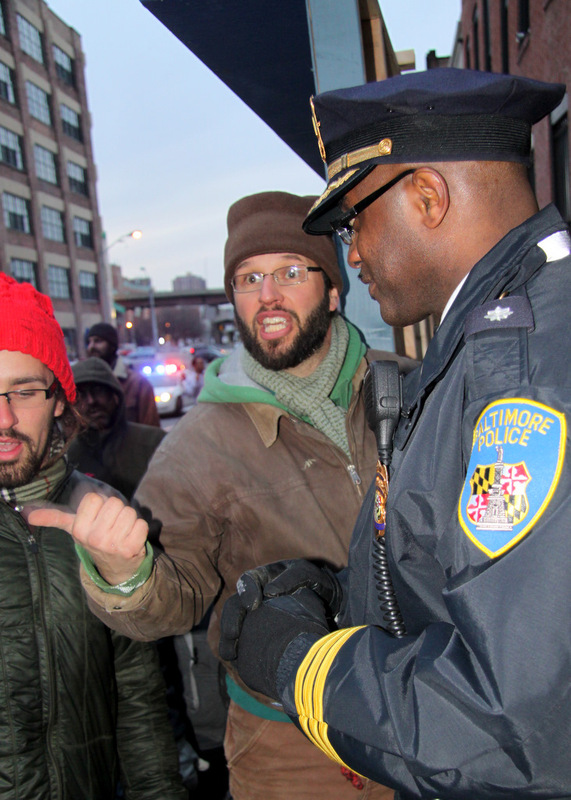 Maryland State Police arrested six people during that Martin Luther King Day protest, including McGuire, and charged them with trespassing. Rec Center sign, after police seized it from protesters, being removed by city workers. (Photo by Fern Shen) he trash. 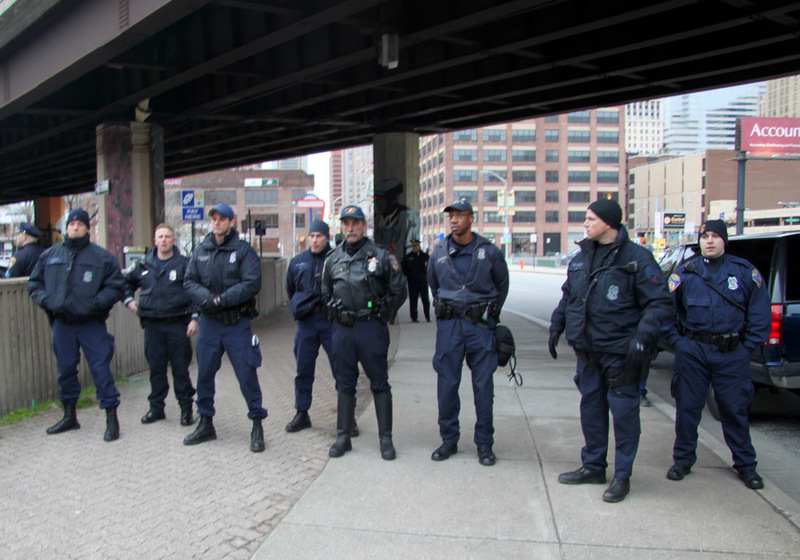 (The denouement of Occupy Baltimore’s encampment at McKeldin Square also featured SWAT team and sanitation workers. That protest lasted 10 weeks. As they did Monday with their tent, protesters today gave way and allowed police to take their sign. “Secure the structure!” a SWAT team leader said. McGuire was especially angry afterwards and said he planned to take legal action. Before the police confrontation, the group managed to accomplish some of its original purpose: to highlight their support for city recreation centers. 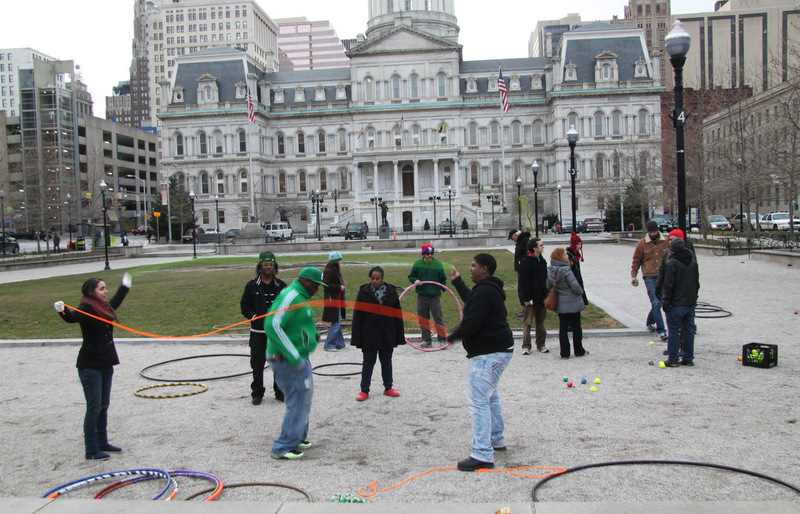 Some played jump-rope,others enjoyed hula hoops and several tried their hand at juggling. Saying that many rec centers are underused and in poor condition, the Mayor has said the cash-strapped city must cut $400,000 from the rec center budget and supports a consolidation plan that involves closing some centers and privatizing others. The group assembled today said that plan shortchanges city youth who need well-funded centers nearby their homes. The PAL [Police Athletic League center] in my neighborhood closed so I went to my grandmother’s house and used the Greenmount rec center,” said Nicole Cheatom, a youth coordinator for the Algebra Project. “I couldn’t believe how bad it was.” She said the roof leaked and there weren’t enough chairs for everyone to sit down.